Red Letters in John 3:16? In John 3, where do the words of Jesus end and the words of the John begin? 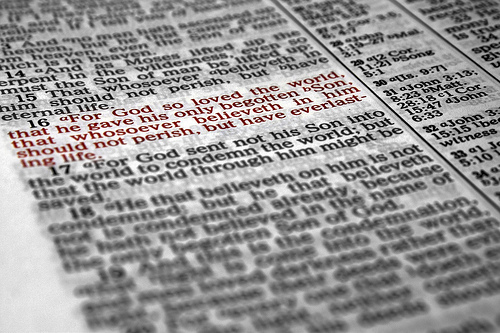 Many “red-letter” Bibles will mark the entire section as the words of Jesus. The ESV, for example, marks the whole section red, but drops the quote marks at 3:15 with an explanatory footnote. The NIV2011 drops the red letters starting in 3:16, while many editions of the KJV run the words of Jesus through the end of the section. The fact that an edition of the Bible prints letters in Red is a an editorial decision. The pew Bibles in my church do not have red letters at all. In fact, according to Wikipedia, the first Red-Letter Bible was printed only in 1900! For many people, the “red letters” are more important that the “black letters” because they are the words of Jesus. In fact, I recently spoke to someone who told me they only read the Red Letters. I suppose that limits one’s reading in the Old Testament, but I think his point was that he wanted to read the Words of Jesus and the color helped him in his Bible reading. While this tradition of printing the words of Jesus in red is relatively recent, the tradition of decorating the “special words” in the Bible goes back to medieval manuscripts. For example,the tenth century Codex 565 is considered one of the most beautiful of all texts, and is housed now at the public library in St. Petersburg. The Gospels are written on purple vellum with gold lettering. The 14th century manuscript Codex 16 contains the Gospels in Greek and Latin written in four colors of ink. The regular text is vermillion, the words of Jesus and the angels, and Jesus’ genealogy are in red, words quoted from the Old Testament and the words of the disciples, Zachariah, Elizabeth, Mary, Simeon, and John the Baptist are in blue. The words of the Pharisees, the centurion, and Judas are in black. Most often Bible editors break off from Jesus’ words after 3:15, making 3:16-21 an exposition of Jesus’ words by the author of the gospel. John 3:13-15 are though to be the words of Jesus since uses the title “Son of Man,” a phrase used elsewhere only by Jesus to refer to himself. The beginning of 3:16 implies an explanation of the preceding section (Köstenberger, John, 114). There is quite a bit a of difference between scholars on where to end the words of Jesus. For example: Raymond Brown and Francis Maloney think that Jesus’ words continue through verse 21 Ben Witherington starts John’s section a 3:12. Schnackenburg starts John’s section at 3:13. In addition, the use of μονογενής, “only born son” in 3:16 is an echo from John’s prologue (1:14, 18). Clearly the prologue contains the words of the gospel writer, not Jesus. The light / dark motif in 3:19-21 is typical of John as well, from the prologue and the epistles of John. That the gospel writer should step in and comment on the words of Jesus is not unusual in John – it occurs again in 3:31-36 where the words of John the Baptist are expanded. Does this issue matter? The fact is that John is recording Jesus’ words in his own language, making it very difficult to sort out when he is offering a commentary on the words of Jesus and when he is reporting Jesus’ teaching. For many, the idea that Jesus did not say John 3:16 is a shock, although the content of that verse is echoed in the dialogue with Nicodemus. Some editors have decided that Jesus’ words in in 3:15 for good reasons and communicate that decision with a splash of red-ink. To me, this is a matter of truth – what did John intend when he wrote John 3? It seems as though his intention was to offer a theological explanation of Jesus’ words, developing several themes which he originally raised in the prologue. Certainly the whole passage is authoritative, whether the words are from Jesus or the inspired author of John. Raymond Brown, The Gospel According to St. John I-XII (AB 29A; New York: Doubleday, 1966). Andreas Köstenberger, John, (BENTC; Grand Rapids, Mich.: Baker, 2008). Francis Maloney, The Gospel of John (Collegeville, Minn.: Liturgical, 1998). Rudolf Schnackenburg, The Gospel According to St. John (trans. C. Hastings; 3 vol. ; New York: Crossroad, 1990). Ben Witherington, III, John’s Wisdom (Louisville: Westminster John Knox, 1990). Your conclusion is spot on. We need to understand that most of the Gospels are an edited version of what was said and not an actual recording / transcript. This doesn’t make the Scriptures any less authoritative, nor does it take away the essence of what Jesus taught. Though, I have never heard it taught that John 3:16 – 21 was considered to be Johns editorial insertion and not the teaching of Jesus.